In case you missed it, unlikely but kudos if so, today (1 November) has seen considerable media coverage of the proposed FITNET trial (of course the acronym has to include the word ‘fit’) being run by Professor Esther Crawley. Costing £1 million, we yet again see large sums of money being spent on studies promoting the biopsychosocial (BPS) model of the disease rather than decent biomedical research. Crawley’s trial draws on a Dutch study which showed no difference between treatment cohorts at long term follow up, though the BBC and their scientifically illiterate journalists imaginatively and dishonestly spun this as a 2/3rd cure rate. Again the laziness and uncritical reporting of any story concerning ME, promoted as usual by the Science Media Centre (SMC), by the UK media is glaring. They even dragged out their old canard, supposed victimisation of the brave researcher (that would be Crawley) by nasty ME activists, said researcher ‘heroically’ carrying on despite abuse from a minority of patients. Such claims were conclusively debunked by the recent First-Tier tribunal Judgement, which ordered the release of the PACE trial data but apparently no one told the BBC. Today’s coverage of FITNET cannot be treated in isolation and should be compared with earlier reporting of the PACE trial by the British media, which was unfailingly enthusiastic, one-sided and uncritical. Both trials have been strongly promoted by the SMC, whose press releases are repeated more or less verbatim by the media, without any attempt to investigate the accuracy of their claims. This is possible in today’s media due to a combination of laziness, establishment cronyism and a lack of scientific understanding amongst journalists reporting on these issues. The extensive coverage of studies promoting the BPS model of ME is in stark contrast to the virtual non-reporting of any biomedical research. The failure of the media to cover the recent dismantling of PACE, extensively covered elsewhere but barely mentioned in the UK press, was particularly revealing. One would think there was a media blackout, with such coverage as there was focused more on defending the PACE researchers than exposing their fraudulent study. Had the media noted the flaws in PACE and the reasoning that underlines such studies so they might have been able to interrogate Crawley regarding the potential flaws in her study. The fact that the participants in the FITNET study will be children, makes it more morally questionable, though her focus on fatigue as the primary symptom suggests many trial subjects probably won’t have ME, as was the case with PACE. No doubt this will flatter her results if/when they are published, not always guaranteed with Crawley as demonstrated by the SMILE trial. Those promoting the MEGA study, including several ME charities, are encouraging patients to sign a petition in its support, an unprecedented action in the field of scientific research and arguably unethical. To expect ME patients to put their trust in a study involving Crawley in such a powerful role is, in my opinion, expecting too much, whatever the quality of the other researchers involved. Especially as those new to the field of ME are likely to put their trust in researchers with the most experience in the discipline, lacking the knowledge of just how flawed that experience is with its strong bias towards the psychological model of the disease. Considering these circumstances, I would encourage people to consider signing the OMEGA petition opposing MEGA instead and direct their energies towards gaining funding for high quality ME research, an increasing amount of which is taking place, especially outside the UK. One final point about today’s coverage of the FITNET trial and the free publicity professor Crawley has received to promote her controversial views. Dr Charles Shepherd, Medical Adviser to the ME Association, was apparently unaware this issue was going to be covered by the media, claiming complete ignorance. This is unacceptable. Our charities should be taking the lead in responding to such harmful propaganda**, as would be the case with any other disease, and their absence ‘missing in action’ on such an occasion, leaving us exposed to this reporting, is letting down the ME sufferers they are meant to be representing to an unforgivable degree. Since writing this piece it has been brought to my attention that James Gallagher, the BBC’s Health Editor who so enthusiastically promoted FITNET, is on the advisory committee of the Science Media Centre that controlled today’s coverage (and pretty much all media reporting relating to ME). I don’t remember his pointing out this potential conflict of interest and I shall be making a formal complaint to the BBC (thanks to Jamie Sugg for bringing this to my attention). This entry was posted in The politics of ME and tagged Awareness, Children with ME, Chronic Illness, Disability, PACEtrial, pwME on November 1, 2016 by Utting Wolff. Thank you, Chris. It’s intolerable to be construed as a nasty malingerer, year after year, decade after decade. So much arrogance, so little knowledge. We shall never shut up and crack this overarching false. Change will come, it always does. To add to the extensive web of dots being joined, the BBC’s Health editor who wrote the BBC News online article is on the advisory board of……the Science Media Centre. How on earth can he be allowed to do that? Please please please can someone in authority get this into mainstream media. Before someone passed this link on to me, I had already fired off a comment to the BBC website about some inaccuracies. Doubt they’ll listen to me though! That would be good. But as Geoff has written here, it’s almost as if there is a total media blackout re any opposing voices, the sinister narrative of Wessely and his cronies has a tight grip on all things ME in the UK. Worrying times, especially as they are allowed to get away with it in spite of so much solid evidence as to their being wrong. Thanks for covering this, it’s such a never ending smack in the face. 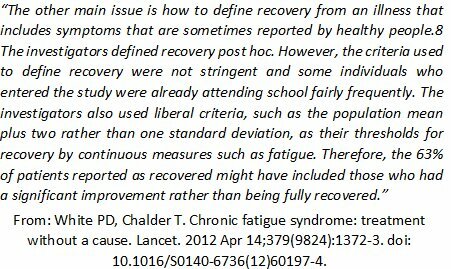 ME is not CFS, and CFS is not chronic fatigue(cf). CBT might help tired people, but it’s torturous and deleterious for people with ME. Thanks for reading and for the reblog, much appreciated. The Dutch study found FITNET ineffective when it studied the broadly defined group of peole with the CDC definition of chronic fatigue syndrome. So Crawley is redoing a study that the Dutch found ineffective and the Sciemce Media Centre and the BBC – think this is great??? What is the back storey? It benefits the insurance industry if a disease is found to be curable, not serious and the victims fault…. Will anyone in the Uk with power ever join the dots, look at the back steely?? The NHS doesn’t benefit by a trial into something that does t work, the UK taxpayer doesn’t….. the patients dont…. Meanwhile at the A international Association fME/CFS- numerous promising biomedical findings have been found – duh….. not mentioned by the science media centre …… not mentioned by the BBC. Instead of repeating on positive biomedical findings the BBC publishes a misleading article about a CBT type of therapy that didn’t work for CDC defined children with CFS in holland. How will this FITNET work in the Uk? Will children with the neurological disease will miss out- will the physiological abnormalities seen in children withstrictly defined ME/CFS be selected to participate? Thanks for your comment, Anna. The story is that James Gallagher, BBC’s health editor, is on the advisory committee of the Science Media Centre, and they run a very tight BPS-driven ship, and indeed censorship. A huge, very complex scandal that has a long history. Professor Crawley. like many others with her (remember Suzanne O’Sullivan), capitalises on this crass form of elitism and arrogance. Written over a decade ago, about the very same psychs. Thanks for your excellent blog piece. Thank you for making a formal complaint. Spinning a null result as a great breakthrough is very dishonest for science media! As is praising and false reporting of a fantasy success rate of a trial that hasn’t even started. The original BBC headline contained the word ‘cure’, we were told, such arrogance and lack of scientific rigour are very disturbing. Thank you for such an excellent summary of the furore surrounding yet another vexatious trial, this time to be inflicted on vulnerable children and their desperate parents. Thank you! It is an outrage. (Do Type-1 Diabetics “fixate” on insulin?). (Thanks to Nasim Marie Jafry’s Twitter for the quotes). I have to say, I do worry that the opposition to MEGA is going to be used against us, spun by SMC et al. as”vexatious” pwME not wanting to be helped…it’s a worrying situation, and sad that the genuine” -omics” researchers are tangled up with the less savoury characters. Thank you so much for this blog. It must cost you dearly in energy. We are of the opinion that we cannot let that faze us. We are past the many (failed) attempts at dialogue and reason. The PACE trial and its spin-offs are regarded as junk science by the international scientific community, UK patients (and others) have every right to protest this gross injustice. We mention the media so often because it is directly responsible for this farce to be allowed to go on. We do live in very worrying times, and supposedly things do get worse before they get better. But we mustn’t let that deter us from demanding justice for ME patients. It is intolerable that they drag children and their desperate parents into this unholy mess, too. As David Tuller expressed it on Twitter today, ‘they really are shameless’. Thank you very much for commenting, it all costs so much energy.